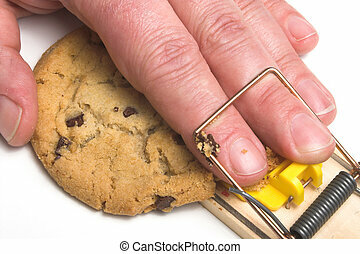 A hand caught in a mousetrap. 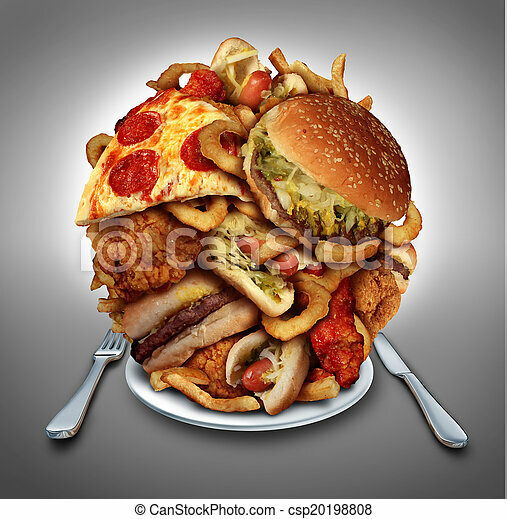 Dieting concept. 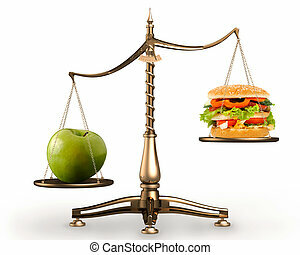 a young woman can not decide between a hamburger and an apple itself. 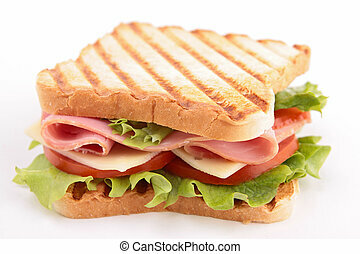 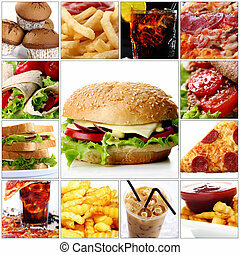 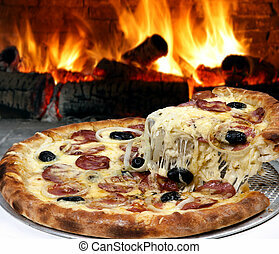 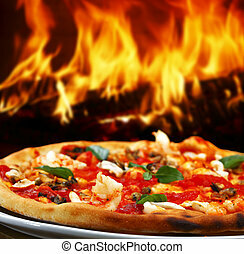 healthy or unhealthy diet. 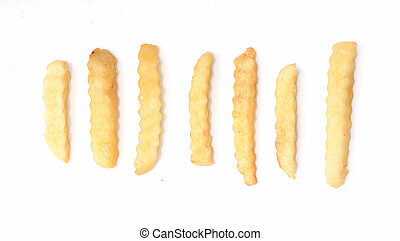 Close up French fries potatoes isolated on white background. 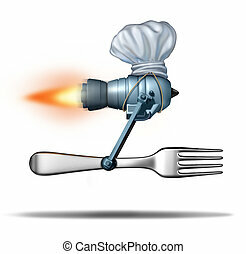 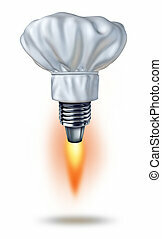 Fast food service symbol with a chef hat attached to a flying rocket booster with a yellow hot flame representing quick cooking and serving food with speed at restaurants or home kitchen meals. 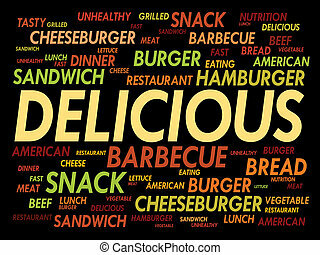 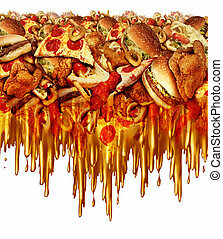 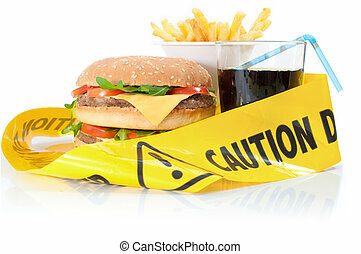 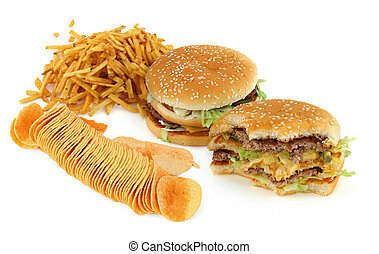 Greasy fast food concept with liquid driping grease as fried restaurant take out with onion rings burger and hot dogs and fried chicken french fries as a symbol of unhealthy diet nutrition. 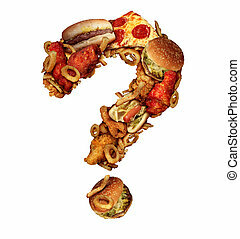 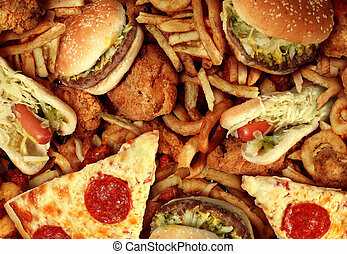 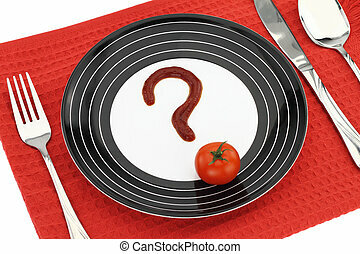 Fast food questions concept and diet worries with greasy fried restaurant take out as onion rings burger and hot dogs with fried chicken french fries and pizza shaped as a question mark for dieting uncertainty and unhealthy nutrition. 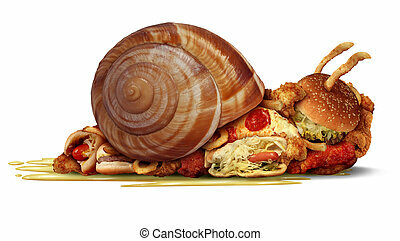 Fast food delivery and quick catering service concept as a jet engine with a fork wearing a chef hat as a meal delivering metaphor for distribution of restaurant dishes. 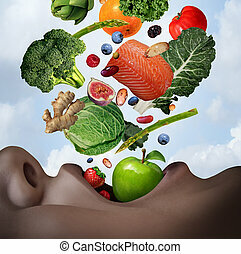 Healthy food diet concept as an open human mouth with nutritious fresh ingredients falling inside as salmon nuts berries beans vegetables and fruit as a dietary and wellness lifestyle in a 3D illustration style. 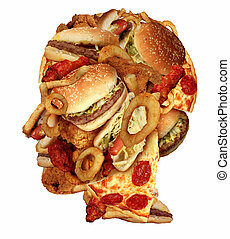 Unhealthy diet health concept with a group of greasy fast food in the shape of a human head as a symbol of dangerouse eating lifestyle and icon of addiction to bad nutrition and risk of heart disease. 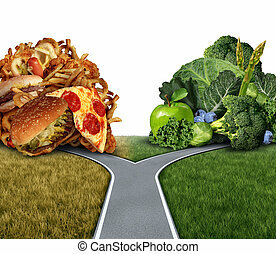 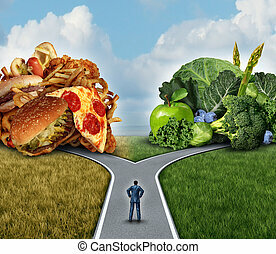 Diet dilemma decision concept and nutrition choices between healthy good fresh fruit and vegetables or greasy cholesterol rich fast food at a crossroad trying to decide what to eat for the best lifestyle choice. 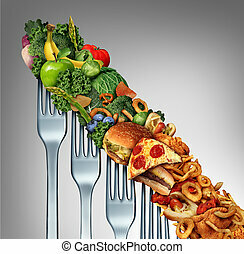 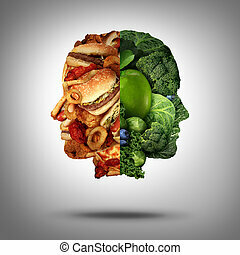 Food concept and diet decision symbol or nutrition choice dilemma between healthy good fresh fruit and vegetables or greasy cholesterol rich fast food as a human head with two conflicting sides trying to decide what to eat. 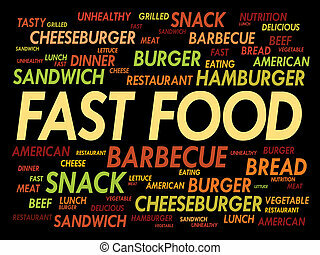 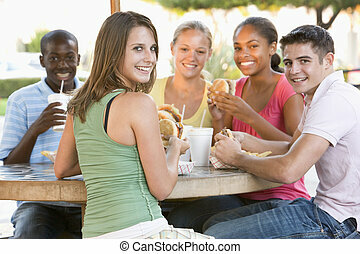 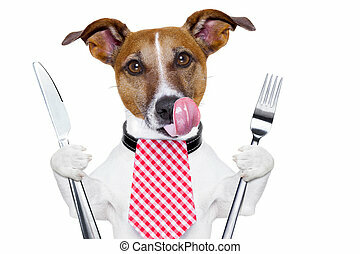 Sluggish diet and weight loss concept as a group of fast food as hamburgers hotdog french fries and fried chicken as a health symbol for a sedentary unhealthy lifestyle and an icon for being out of shape.. 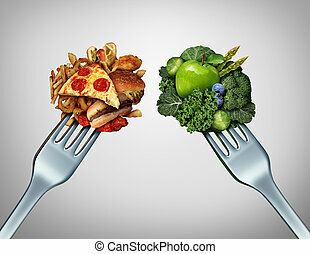 Diet relapse change as a healthy lifestyle slowly goes downward to greasy unhealthy fast food concept as a dieting quality decline symbol of returning to bad eating habits as a group of descending forks with meal items on them. 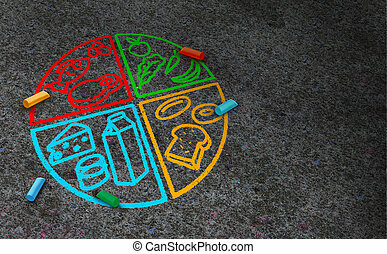 Food balance nutrition idea and healthy diet eating from four groups including dairy protein vegetables and grain in a 3D illustration style. 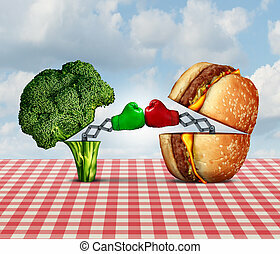 Diet battle and food fight nutrition concept as a fresh healthy broccoli fighting an unhealthy cheese burger with boxing gloves punching each other.